The Klark Teknik DN 780 digital Reverberator/Processor is not simply a reverberation device. The Klark Teknik DN 780 gives the user a unique and flexible means of producing realistic acoustic simulations for environments of all types and sizes. The provision of effects programs further extends this versatility, making the Klark Teknik DN 780 the most powerful acoustic processing package currently available. Not happy with current designs with narrow fields of useful application, our research has led to a new operating concept for the Klark Teknik DN 780 to extend versatility, backed by an advanced high speed digital signal processor designed to handle the necessarily complex computations. This technical innovation results in extremely high density reverberation with convincing small room performance, authentic concert hall reverberation and a wide ranging choice of basic ‘acoustic spaces‘, both natural and unnatural, selected by the innovative reflection ‘Pattern’ control. The remaining controls give accurate adjustment of all reverberation parameters, including ‘Roam size’, and when used with the ‘Pattern’ control these allow the engineer to create unique acoustic environments of virtually any type. A number of factory-set acoustic simulations are available: see ‘Software‘ section. It is important to note that all these very different sounds were created using only the controls you have available: for example there is no dedicated ‘Room’ program as such. A room sound is created using the appropriate pattern (‘2’), and adjusting other parameters as required. The factory-set memory locations should be used, then, as a reference point from which to create your own variation, forget the limitations of a dedicated system and let your creativity reign. Fifty non-volatile memories are available for entering user variations and the sequence function allows instant recall of up to 16 factory or user memories in required order, allowing rapid movements through a series of previously planned acoustical settings for mix-down, film dubbing, t.v. production or live performance. 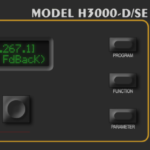 The remote control unit allows the chosen acoustic setting to be first selected, using the sequence key and then modified using the parameter sliders. The Klark Teknik DN 780 performs to the highest specification and is engineered using the latest technology to keep component count down and reliability up. Electronics use a semi-modular system of construction distributed logically on six printed circuit boards, eliminating unreliable edge connectors whilst avoiding the servicing problems of single board systems. The Klark Teknik DN 780 is a compact 2U, 19 inch rack mounting device equally at home in the recording studio, dubbing suite, broadcasting studio or on the road.